The definition of demonstration of lower value, or DLV for short is to do or say something that makes you less valuable in the eyes of the girl that you’re currently pursuing. This can be something that you say, but it is usually the result of a certain behavior. In most cases, the result of DLV is usually less attraction and it can be the cause of break-ups in certain cases. However there is an exception where DLV is actually beneficial and will increase attraction, we’ll cover this exception in this article. If we were to generalize and say that the idea behind attraction is that we’re attracted to people that are valuable, then DHV would be the term to represent increasing that value and DLV would be decreasing in value. The perception of value changes from person to person and therefore what is DLV for one person might not be for another. Here are some general examples of how guys accidentally DLV themselves on a regular basis. 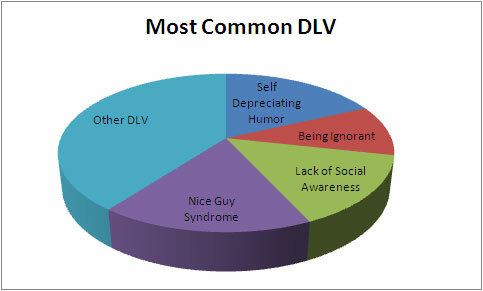 These are the most common examples of DLV that one might encounter on a regular basis. Although it’s not always obvious, these tend to lower your value in front of women. There are numerous more that range from being childish to simply being rude, all of which show that you don’t have any class. One of the most frequent DLV’s that I see is that guys put down their friends in front of women. People tend to surround themselves with people that are like them, and if you put your friends down then you’re only putting yourself down by association. As a general rule, displaying lower value is not a good thing. So if you catch yourself putting yourself down from time to time, know that you’re only reducing any possible attraction. Instead, I suggest you adopt a slightly more confident attitude and watch the results! I wish you would expand or just offer some advice on one specific DLV topic. What causes a woman to see “nice guy”? How nice is “too nice”? How do you counter “too nice”? I see that nobody answered your question…. neither do I, but i do recognise myself in that too nice ‘girl’ in my case. I think that too nice is negative dlv, because people pleasers like that, seem to be submissive. And attractiveness is explained as being successfull. self depreciating,trying to impress people, perform too many favors, not standing up for themselves, being ignorant (what people take you for, they will always try to fool you), caring about what others think (people tend to think that you like to please them because you’re afraid of rejection), poor social awareness…. Hope this helps you to understand a little bit. As i said already, i have the same issue but i’m working on it.